Looking at art is one thing. It’s easy, as a viewer, to walk into a gallery or a museum (granted it’s free and not tourist-ridden like the Louvre) and take in the tantalizing brushstrokes, figures, and compositions of painters, sculptors, and craftsmen alike. It’s even easy to talk about art—just drop the words “color,” “shape,” and “chiaroscuro,” and you’ll be fine. But to purchase art and make art—now there’s the rub. Art can be expensive, exclusive, and, for those who create it, difficult to market in an area as disparate as the Central Coast. Enter ARTshare—an inaugural program intended to help bridge creators and collectors across the coast. 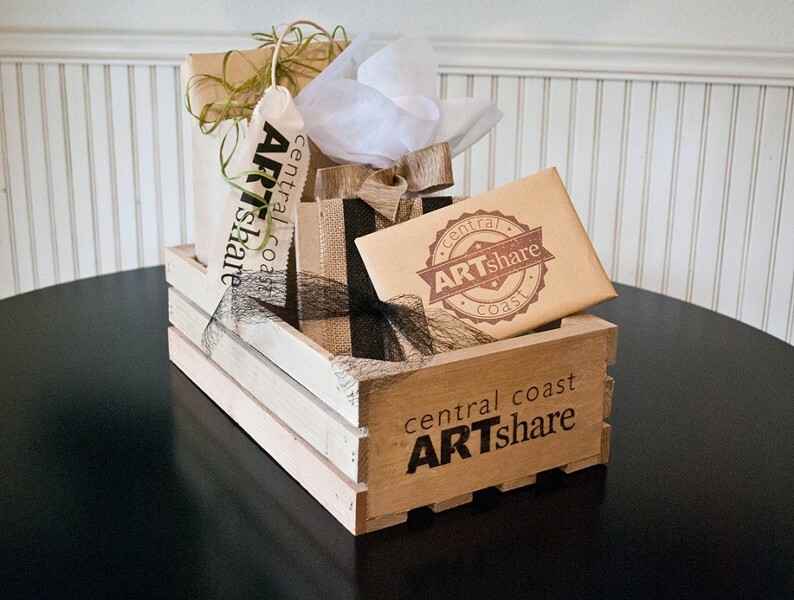 BOXED GOODS: Patrons who purchase shares will receive their original, handcrafted art pieces in a package similar to the one pictured at an annual Pick-Up Party, where they can meets the artists amid the delights of wine, food, and music. ARTshare works like this. Local artists apply to the program. They are chosen by a panel of judges. Then, they receive a $1,000 commission to create a total of 50 original pieces. These can be anything in the finer arts, from painting to mixed media to sculpture. There are some restrictions. The dimensions should fit within a 12” x 12” x 12” parameter, but there is some wiggle room. Meanwhile, patrons, collectors, or anybody interested in buying art can purchase “shares” (one share=five of these works of art). Upon the completion, there will be a “Pick-Up Party” where the shareholders can not only receive their custom artwork, but also mingle with the artists. It’s a creative and community-based endeavor that’s already become popular in areas like Los Angeles and New York. For Robin Smith, a local resident and the architect behind ARTshare, the idea to initiate this kind of program on the Central Coast came around the time of her 50th birthday. For most of her life, she’s been in the business of professional video production and marketing. But, as a kid, her passion was art—painting, in particular. When she hit that benchmark age, she decided not only was it time to do something different, but time to get back to her artistic roots. This is the other key component of Smith’s grand plan. In addition to receiving commissions and local patronage, ARTshare provides a free workshop on the business of art as well as a custom video profile, produced by the Emmy Award-winning Smith herself. Now, I know what some may be thinking. Business and art don’t mix for a reason. The former corrupts the latter; Art exists on a purer plane beyond the realms of petty cash. But Smith maintains this is not the case. For both artists and patrons alike, money and marketing are a real challenge that can cut off creativity. CALL TO ART: ARTshare is currently looking for artists to apply! The deadline is Dec. 15. For the application and for more information, you can visit centralcoastartshare.com. Like the Creative Economy Forum sponsored earlier this fall by ARTS Obispo, Smith’s ARTshare program means to mix business and art in meaningful ways that are mutually beneficial. With this program, up-and-coming artists can gain exposure and opportunity while local residents can encourage them at a relatively low cost. Jessica Peña doesn’t have any art for sale—only Beanie Babies. If interested in buying one, email her at jpena@newtimesslo.com.